Relax and enjoy the Caribbean lifestyle with gear from the Margaritaville Caribbean catalog and easy going savings with the coupon code for clothing, beach apparel, shoes and Jimmy Buffet barware. 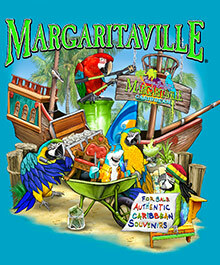 Your Free Shipping will be automatically applied at checkout on the Margaritaville Caribbean website. Jimmy Buffet Tshirts - Put the whole family in Jimmy Buffet's Margaritaville Caribbean t shirts and tank tops. If you know the words to Parrothead anthems then you need the tee shirts that advertise your state of mind. Your "Growing Older But Not Up" and "Passed Out in My Hammock" will let everyone know that relaxation is your priority, whether you are on the beach or just hanging in the backyard. You will love the easy to wear comfort of these tees and tank tops, in bright colors and funky tye dye designs. Ladies Beach Fashions - If you are looking for relaxed resort tee shirts cut to flatter, you will love the flattering v-neck shirts with colorful Jamaica flag or Cayman Islands graphics. The only thing better than sand between your toes are Margaritaville shoes, especially Live Life Like a Song flip flops. The shorts, tanks and beach wear here will be your go to looks for every day you want to add some Island flavor to your wardrobe. Ball Caps, Bags and Packs - How do you get your gear to the beach? In relaxed Parrothead style, of course, with a Chich sack or duffel bag that is just roomy enough for your resort essentials. Grab a straw hat for your day in paradise, or top your beach look off with a Grain of Salt cap. Grab an extra mesh cap for your buddy: who could argue with headgear that proclaims "Changes in Latitude, Changes in Attitude." The right beach accessories make your Margaritaville clothing a lifestyle statement. Margaritaville Collectibles - Chill in Paradise and every minute at home too with bar accessories, barware, and colorful logo mugs that say "No shoes, no shirt, no problem," mon. Magnets, window decals, mousepads and shop towels proclaim your commitment to the Parrothead lifestyle, and make great gifts for the Jimmy Buffet fans in your life. Buy a collection of logo postcards to share your relaxed state of mind with your envious friends. This is the one stop shop to find iconic Jimmy Buffet beach wear for women and men, in styles and colors just right for the hammock or kicking back at your favorite summertime concert. If you have island fever, this is the place to find a fun logo shirt that advertises your attitude of the moment.